Sofia/Mechernich. What a difference a year can make. After exhibiting for the first time last year at the Bulgarian BEGE gaming exhibition, it was clear to see that GeWeTe has made a lasting impression. More local operators came explicitly to see the GeWeTe team this year and learn more about just why GeWeTe is the quality leader for change and redemption machines. GeWeTe has almost twenty-five years of experience in this field and is the clear market leader in its home country of Germany. 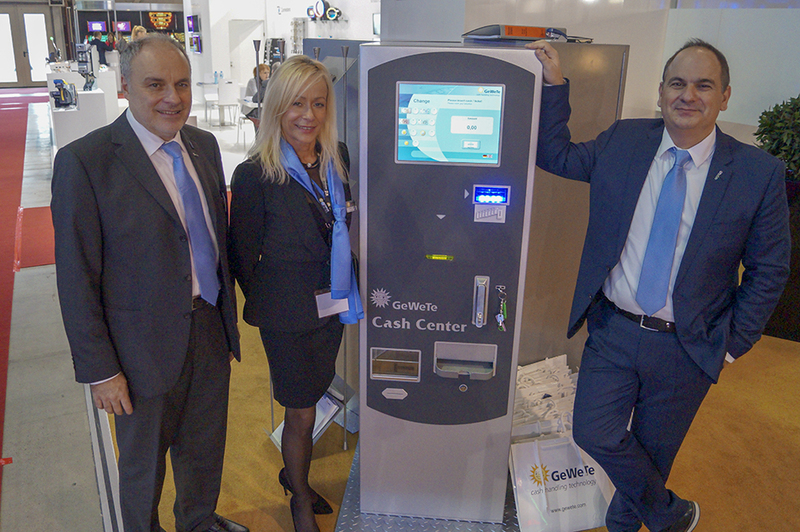 GeWeTe has delivered well over 60,000 change and redemption machines to the global market throughout the years. This ‘made in Germany’ technology is so precise as GeWeTe controls 100% of its product – from the design stage, right through to R&D, manufacturing and after-sales. “We place great emphasis in all we do. We know how important and secure our solutions have to be given the amount of money stored in them. Not only that: we have an extremely wide product range – to ensure that we have the right solution for every application”, explained Mr. Aristidis Tsikouras, Managing Director of GeWeTe. As an international leader in change machine and redemption solutions, GeWeTe brings great experience and with that an unbeatable product range to the market. It is this in-depth market knowledge and the fact that the entire development and production process is controlled at the headquarters in Germany that has brought over twenty years of success to the company. The ideal solution for the Bulgarian market could be seen on the GeWeTe section of the Merkur Gaming stand (both belonging to the Gauselmann Group). The Cash-Center-Compact is fitted with a 7” touchscreen and offers extensive coin and banknote change capacity. Great change giving capacity is guaranteed with note dispensers that can store up to 2,000 banknotes alongside further banknote recycling capacity. GeWeTe is particularly strong in the sports betting market. To-date over 40 sports betting providers in Europe have chosen GeWeTe as their provider of change giving / redemption solution. Naturally all the required technology if fitted so that the customer can redeem his or her winnings directly at the GeWeTe machine. “At the end of the day – investing in GeWeTe provides not only peace of mind due to our excellent reputation. Our machines last longer – we believe that the cost of ownership is the lowest in the market as less maintenance is required, our machines remain up and running longer and they last longer”, concluded Mr. Tsikouras.